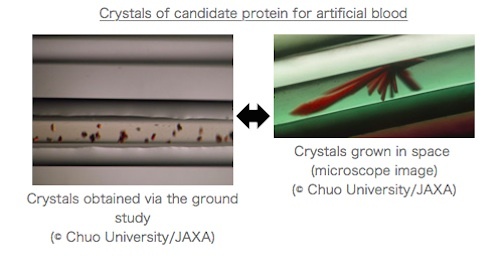 Samples of the protein crystals for the JAXA PCG experiment launched alongside Astronaut Kimiya Yui aboard the Soyuz TMA-17M spacecraft (43S) on July 23 have completed growth in space and were returned to Earth on September 12. The samples later arrived in Japan on September 14 for analysis. 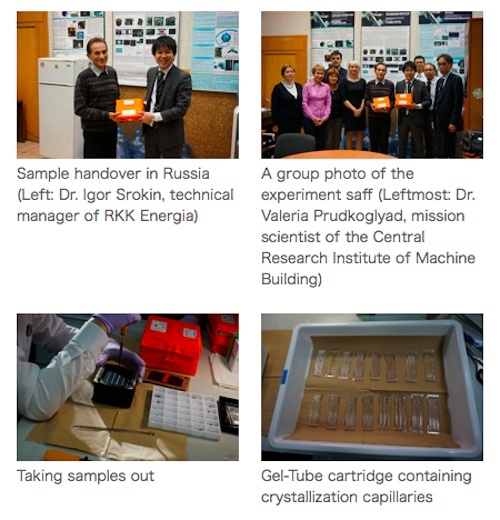 Returned protein crystals were handed over to JAXA at a facility of a cooperative research institute in Russia. Protein crystals returned from the International Space Station (ISS) on September 12 were immediately retrieved and viewed under a microscope on September 15, in order to determine their condition. These obtained samples will be handed over to researchers for analysis at synchrotron radiation facilities (such as SPring-8). 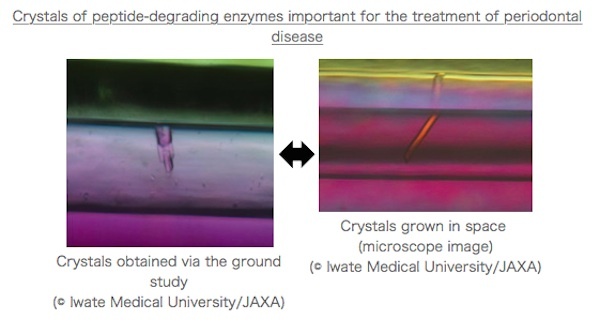 Here we introduce some microscope images of the JAXA-sponsored protein crystals. In 2013, the group headed by Professor Komatsu of Chuo University developed a candidate protein for artificial red cells that can be created by altering naturally occurring proteins. The team now intends to obtain detailed structural data by conducting a space experiment to validate safety and efficacy for commercialization. The results of this research may lead to the development of artificial blood that can be stored for a long term, and which could resolve the shortage of donated blood in the event of a large-scale disaster or due to a reduced birth rate. The AIST team developed a probe* that selectively isolates anaplastic human iPS and ES cells without affecting the growth and life of differentiated somatic cells. *Probe: A substance used to detect specific molecules or cells. There are high expectations for human iPS and ES cells to be used in regeneration medicine; however, differentiating all human iPS and ES cells to the intended cells is currently quite difficult. A certain number of anaplastic cells are included in the transplanted cells and could cause a tumor afterward. The probe was developed to remove such anaplastic iPS and ES cells. This probe visualizes live human iPS cells to remove anaplastic iPS cells for transplant, and is expected to accelerate the application of iPS cells to regeneration medicine. Crystals obtained this time show a different shape than those grown on the ground. Favorable data acquisition is expected (see image below). This research aims to closely study the structural data of crystals obtained in space and investigate how the probes and cells are combined, which will result in the creation of a high-precision probe useful for the quality control of human iPS cells. Through space experiments the team has studied the 3D conformation and mechanisms of the substrate binding of peptide-degrading enzymes that are important for the growth of multidrug-resistant bacteria and periodontal disease bacteria. To seek for a drug candidate and conduct rational development, the group aims to clarify the 3D conformationa of a complex combined with a candidate inhibitor. Hopefully the result will to lead to the development of a new antibacterial drug for multi-drug resistant bacteria, a cause of nosocomial infections, and also a drug for periodontal disease.